Do you expect things to go as planned? I saw this post earlier today and I couldn’t help thinking how much it relates to golf and the way we approach it. So often, we set high expectations for ourselves, especially when we’ve been working hard on a particular aspect of our game, like chipping, putting, or driving. Then when things don’t go as planned we stop having fun. The problem is that this way of approaching the game, makes it harder to perform well. It gets in the way. Or rather, our expectations get in the way. I want to make a distinction between this and confidence. You can have confidence without expectations getting in the way. Confidence is a great thing to have. In fact it’s what we want to develop in our game. We want to have confidence that we can hit the shot we’ve committed to hitting. But I think the greatest confidence comes from knowing that you’ll be all right even if things don’t go as planned. Watching tournaments on tv you’ll often hear players who are playing well talking about the way they felt during the round. They knew that even if they missed some shots, that they’d be able to get up and down. This kept them in the moment. You’ll see the opposite from players who are playing poorly. Every bad shot is an arrow through the heart of their confidence. Every bad shot makes them more miserable. Frustration sets in and bad shots begin to pile up. It’s not easy to play without expectations. But I’ve found a few techniques that help. 1) Focus on this shot right now. Forget about what happened on the last shot, or the last hole, or the front nine. 2) Make a conscious realization that if the shot doesn’t go as planned, you’ll still be ok. Golf isn’t life or death. It’s a game. It’s a maddening game, but it’s just a game. Learning to let go of the outcome is incredibly powerful for many reasons. Author Zen ChiliPosted on August 18, 2011 Categories Course Management, Life Lessons, Mental GameTags Mental GameLeave a comment on Do you expect things to go as planned? 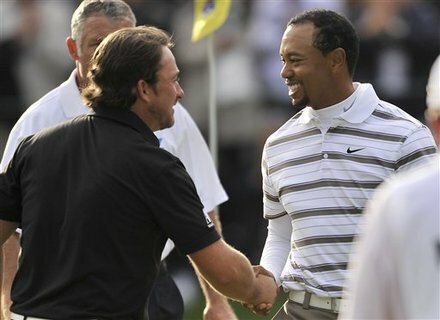 GMac’s victory at the Chevron this weekend over Tiger Woods is a wonderful example of not giving up. He continued fighting even as things seemed to be breaking down around him. His miraculous bogey on 17 kept him in it. Tiger then hit it tight on 18 giving McDowell a must make putt with a lot of pressure. He made a gritty 15 footer for birdie putting the pressure on Tiger’s short putt. On the first playoff hole, as they played 18 again, Tiger left himself with an almost identical distance for his approach shot. Graham had a shot from about 175 over the trees. He hit a good shot and left himself a nearly identical putt to the one he made to force the playoff. Tiger Woods hit a solid approach shot inside McDowell’s ball giving him an advantage. As we all know, McDowell sank that putt again putting the pressure back on Tiger and Tiger’s putt slid past the cup, giving GMac an impressive victory. I can’t really think of many people who would handle the pressure the way he did. Think about how you would have handled the pressure. I was absolutely amazed at the gritty resilience that GMac showed. I know I couldn’t have handled that kind of pressure and it is inspiring for me. I want to give you another example of not giving up. In one of my last rounds this year I started out 7 over par for my first 9 holes. Throughout those first nine, I just could not find my game. My short game was off, my putting was off and my ball striking was off. It was very frustrating. I could have easily given up and gotten mad. I could have complained about the weather, or the pace of play. But stuck it out. I determined that I was going to enjoy the rest of the round no matter what. The back nine turned into the best nine holes I’ve had all season, scoring wise. It was a real grinding round though. On my tenth I hole missed the fairway way right. I hit a short iron over the trees, onto the green and two putted for par. On the next hole, a downhill par 5 with trouble right, I hit my tee shot into the right rough, laid up, missed the green short right with my approach from 115 but I managed to chip it to 8 feet and sink the putt for par. The next hole brought the first birdie of the round along with the only fairway hit. Hit the green and sank a 10 footer for birdie. The next hole is the number one handicap hole on the course. I hit my drive through the fairway just missing a fairway bunker. With 145 yards left, I hit an 8 iron to 10 feet and sank my 2nd birdie putt of the day. The following hole brought me back to reality a bit. A long par 3 with trouble left and long. I hit my tee shot way right, hit a fat chip, chipped again into the bunker, splashed out on to the green and 2 putted for a double bogey 5. I’m not going to lie to you, that one hurt. On the next hole I hit a long straight drive that ended up in the rough through the fairway. I had a decent lie and 225 yards left to a severely uphill par 5 green. I took out my fairway wood and hit a solid shot out of the rough that came up 15 yards short of the green in the rough. Chipped up and 2 putted for par. The next hole, a dog leg right par 4 with severely tree trouble at the dog leg was next. I hit a decent tee shot that got slightly past the dog leg but left me in the rough with a large overhanging tree. I needed to hit a low shot that would get to the back of the green. I hit a 3/4 6 iron from 155 that just got through the back of the green. I had a decent lie so I opted for the hybrid chip and the ball stopped 2 inches from the cup. Tap in par and on to the next hole. The eighth hole on this back 9 is an uphill par 3 that reads 195 on the card but plays more like 205 – 215. Although I was trying for a draw to the left side of the green, I left the club face open and the ball ended up down the right side. I was left with a shot off hard pan, to a green 20 yards above my head and overhanging trees. After much deliberation I selected a lofted club. I hit a good shot and got a nice break off a branch that left the ball 4 feet from the cup. I made the putt. I call the last hole my nemesis. It’s a hole that for some reason always gives me trouble. It’s a long uphill par 4 with one of the toughest greens on the course. I usually feel pretty good if I walk away with a bogey. I hit my drive long, but right onto the next fairway. I was left with a 200 yard shot over trees to a pin tucked on the right, 2 bunkers right in front of it. The wind was swirling and in the end I picked a 4 iron. I hit a good shot, but the wind killed it a bit and I ended up in the bunker, short sided to the pin. My bunker play had recently been a strength so I felt the shot I wanted to hit. I got cute with it and dumped it into the rough short of the hole. Feeling par slip away, I took my PW and hoped to get it close. Miraculously the shot went in and I saved my par. On that back nine I hit 1 fairway in regulation, had a 1 chip in, and a grand total of 11 putts. I don’t think that would have happened if I had given up after the first nine. In the end I walked away feeling great. Never give up. You never know what can happen. This week’s WGC Bridgestone Invitational provided a unique learning experience. Did their expectations do them in? We saw the world’s number one player, struggle to his worst finish as a professional, while the number two player in the world was coping with a new kind of pressure, the chance to take the number spot away from Tiger Woods. So why weren’t Tiger and Phil able to muster anything better than +7 and +8 respectively? Was the course unfair? Hunter Mahan shot a 64 on Sunday to win by two shots. Goosen, Furyk, Harrington and Oosthuizen had good rounds in the mid 60s. So I would say that the course was not unfairly setup. I think two things happened. It appeared that Mickelson became very technical. His swing wasn’t as fluid and powerful as he usually is. And his putting was shaky at best. I think Tiger phoned it in. He had given up hope, he had lost his fight, and he just wanted to get out of there. What’s interesting about the Tiger story for me is that he had felt that his game was where it needed to be. He thought that he had found some keys to playing well again. He also had a lot of confidence from the venue itself. He had won 7 out of the last 10 times he played without finishing worse than 4th. Given all those factors he came into the event expecting to contend, if not outright dominate. Could Tiger’s expectations been his downfall? Where they realistic based on the amount and the way he’s played this year? Did he put pressure on himself in a way that he’s never really done? As a golfer who is working his game down to scratch (though I still have a way to go), I got a lot out of watching this event. Surprisingly the lesson I came away with was to be kinder and more patient with myself. If the world’s #1 and #2 players, can have days like those, why am I expecting so much of myself? Why don’t I just play the game, shot by shot, and see where that takes me? Recently I had worked really hard to prepare for my local city championship. It was my first time qualifying for the event at the Championship division, meaning there was no handicap. I prepared for several weeks, and felt my game was ready for the event. I ended up playing some of my worst golf in recent memory in those two days and missed the cut by a wide margin, and although I can’t draw a direct comparison to what happened with Tiger and Phil, I believe I can learn from what I saw this week at the WGC. It is frustrating to show up at the course without the game you know you are capable of. It is even more frustrating when it is a tournament situation and you realize you just don’t have it that day. How can you turn it around? How can you post a good score, when you don’t have it, and how do you change what you are thinking so that you can change the experience? Days like that happen to everyone. If you come in with high expectations you automatically put more pressure on yourself. But you can’t come into it with low expectations either. I think one of the hardest things to do is to set aside your expectations and just play the game. As I kept thinking about what the way Tiger and Phil played, for some reason I thought about that Rolling Stones song “You can’t always get what you want”. I think that every round of golf, every shot has a lesson, “But if you try sometimes/you just might just find/you get what you need”. I’m using that tournament experience as something I can learn from. And just remember, it happens to everyone. Be kind to yourself, stay patient, and good things are bound to happen when you get out of your own way. Today I headed up to play Richter Park Golf Course, one of the public course gems in Danbury, Connecticut. I was unsure of what results I was going to get as this morning I decided to implement some swing changes. I also upon arrival at the course, took my 4 wood out of the bag. This club has been giving me trouble recently as the shaft has a completely different flex than what I am now used to in my irons. I decided that I did not even want to be tempted by it. After hitting a few wayward drives (two that went OB on me) I decided to also leave the driver in the bag the rest of the round. I just wasn’t feeling comfortable with it and it just wasn’t working well with the swing changes. Besides Richter Park is not so long that I would miss the driver. So I spent most of the round teeing off my 18 degree Cobra Baffler pro hybrid and decided that I would play the par 5s as 3 shot holes. I was hitting the hybrid probably 20 yards behind where I would normally hit my driver and so much straighter. On one hole I went hybrid – lob wedge and ended up about 8 feet from the pin slightly above the hole. The only hole where driver would really have made a difference for me was 18. I thinned the hybrid and ended up with 205 to the back of the green, to a green perched roughly 15 yards above me. I would have proffered a shorter second shot but that’s golf. I was pretty amazed at how well the swing changes worked. My irons were crisp and very straight. I ended up with an 81 that could have been even better had I left the driver in the car from the beginning. I had 2 drives that went OB on me, and without those penalties the score could have been much lower. However, my irons were crisp, as were my wedges. I had really solid distance control all day and I’m excited for what these swing changes will bring. During the round I also decided to implement the strategy from this article about asking the right questions. The other thing that has improved my scoring is Game Sense. Even when I don’t hit pure shots, I’m leaving myself good opportunities to save my score. Deciding on the correct strategy based on what I brought to the course that day has now become second nature and it really makes the game so much more fun. I recognize what the course architects are trying to do to trick golfers and I can very easily select the right strategy. Sun Tzu said, and I’m paraphrasingm that every battle is won or lost before it has even begun. Although golf is not a battle it is a competition between you and the golf course. Use the right strategies and make the best decisions and you give yourself good opportunities to play well. GPS rangefinders are wonderful things. They give you the distances you need to make smart decisions. They give you the distances to hazards, to carry over the hazards. They give you distances to fairway targets, and of course the front, center and back of the green. This information is vital if you want to make good decisions on the course. What they don’t give you is the strategy based on the conditions of the day, how you’re striking the ball, and the pin placements. They also don’t take any pressure into account if you’re playing a Nassau, a match against a buddy, or a tournament. Some of you are lucky enough to play with caddies and if you to have a good caddy, he or she, can save you many strokes. But for those who don’t have our own caddies or get to play routinely with caddies we need some help making those decisions. If I’m playing a par 5, and I have 245 yards to the pin, 230 to the front, and 260 to the back I will know the distances I need to reach the green, but the rangefinder can’t tell me if it’s a smart decision. Whether it is a smart decision depends on a number of variables. What’s the wind doing? If I’m playing into a 15 mph wind can I get there? How am I hitting it that day. Am I striping my fairway woods or hybrids? Am I fading or drawing the ball? Are there hazards near the green? Where is the pin, and is it near any hazards? How’s my wedge game that day? If it’s really on, it may be worthwhile to lay up to my favorite full wedge. All of these factors need to be considered because my main objective is to leave myself in the best position for the next shot and to take a high number out of the equation. What the GPS rangefinder does, is that it gives you the numbers you need to make decisions about where your target should be. Great course management combined with the data from the rangefinder will provide you with the best chance to shoot low scores. Simply using the rangefinder without the course management won’t necessarily help you make good decisions. And good decisions lead to low scores. When you can consistently make good decisions you can play well anywhere and on any course. Phil Mickelson’s miracle shot on 13 on Sunday will go down as one of the great shots of Masters history. It will also be a big setback for the average golfer. There is no doubt that Phil Mickelson has an overload of talent. He has shown that over years pulling off incredible shots. But he has taken risks that have cost him tournaments, most notably the US Open at Winged Foot. The problem isn’t that Phil tries those shots and sometimes pulls them off. The problem is that he influences golfers and they begin to think they can do the same. We’d all love to be able to strike the ball like Phil but even most golfers in the field at Augusta on Sunday would have laid up. With Phil’s talent he would have scored a birdie 80% of the time laying up, and he in fact scored a birdie. Was it a heroic shot? Absolutely. Was it smart? Probably not. The par 5 13th had been giving up lots of birdies. Phil’s mistake is that he brought bogey into play. Luckily for him it didn’t turn out that way, but pine straw is not easy to hit out off. He could easily have ended up in the creek, pitching onto the green for an un-guaranteed par. The conservative route wouldn’t have brought bogey into play unless something disastrous had happened. If we take a look at the risk vs the reward, it wasn’t a smart play. Now to the average golfer. The average already has a hard enough time making smart decisions on the course. Most golfers I play with are constantly making decisions that bring double bogey or worse routinely into play. They could not only score much better, but take many headaches out of their rounds if they knew how to make better decisions, but they don’t know. When faced with a choice like Phil’s, many golfers would try the hero shot because if they can just pull it off, they’ll get a nice ego boost. More than likely though, they’ll end up with a big number and wonder why the can’t break 100, 90 or 80. This is where Game Sense comes in. It teaches you how to make the best decisions on the course. Get that understanding and you can expertly avoid trouble and give yourself stress free pars. Have you ever had a stress free round of golf? Do you rush to the first tee? What are your rounds of golf like? Do you rush to the tee without much of warmup, maybe passing by the practice putting green to take a couple of putts? Do you then wonder if the number of balls you have in your golf bag are going to last the whole round or whether you’ll need to reload at the turn? Do you know that you can expect a numer of double bogeys and worse along with a few three putts and feel he inevitable coming? I want to offer you an alternative. I want you to imagine stress free round. What would it look like for you? For me, a stress free round means no scores worse than bogey. It means at least a par putt on every hole with a few putts for birdie thrown into the mix. It means that my misses end up somewhere near the green where I have an easy chip or pitch onto the green for my par putt. And it means no three putts. Does this sound like a sweet dream to you? I want to tell you that it is possible. I had a round like this a few days ago. What did it take? It took making good decisions. A good decision on the golf course is one where if you pull your intended shot off you are in a good position to score, and if you don’t pull the shot off you are still in a good position to score because the area where you missed your shot has not brought a high number into play. Sounds easy but most golfers don’t know how to do this and it is not their fault. The golf industry glamorizes distance instead of good decision making. And it’s understandable. Distance sells equipment. Good decision making does not. The other reason most golfers don’t know about it is their teachers don’t suggest it. Golfers generally take lessons to fix their swing not to learn how to score and there is a big difference. That stress free round showed me how fun and easy golf can really be. My goal is to play stress free golf. I encourage you to try it, you can learn the strategies here. Author Zen ChiliPosted on April 15, 2010 April 22, 2010 Categories Course ManagementTags Course Management, Mental GameLeave a comment on Have you ever had a stress free round of golf? 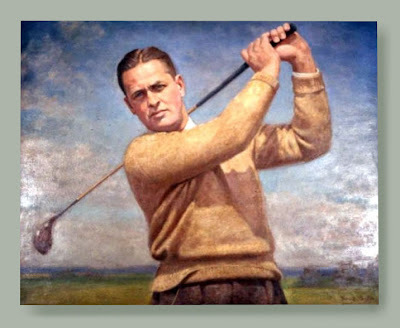 While watching the Masters this weekend there was a really interesting segment about Bobby Jones. Although he had a 14 year career as an amateur, it was only in the last seven years that he won his majors. It turns out that he had a bit of an anger issue. And when he lost his temper, his game went right out the door with it. It took him years to get over that and to decide that all he needed to do was beat “Old Man Par’, instead of everyone else and that’s when he started to win majors. I think we’ve all felt something similar. When a bad hole gets to us and rather than staying calm and just playing the round, we get off any plan that we had, and we start to take big risks and end up in worse trouble. I wrote about John Daily doing this a while back. We can’t expect perfection on the golf. Even watching the best players in the world they don’t play perfect. How can a 5, 10, 15, or 20 handicap expect to play perfectly when the best players in the world can’t. What we need to do is play smart. You may not always be striking it as well as you like, and you may not always be chipping it close, or putting lights out, but you can minimize the impact of mistakes and still shoot good scores even if you don’t have your A game. It’s amazing what happens when you learn to play this way. It takes pressure of your long game, and your body tends to react by playing well again. This is what Game Sense is all about. It’s not about perfect, it’s about playing smart. It’s about scoring well with the ability you have, and it’s about getting the most of out it. And you don’t have to have a perfect swing to shoot low scores. I wish more golfers would understand this. It makes the game much more enjoyable, and ironically, it helps you play better.